This mixed-use community features restaurants and various shops all within walking distance of our luxury apartments. At the heart of Spectrum is Performers Park, a labyrinth splash pad fountain with a fully equipped stage for musical performances and community events. Spectrum brings you the experience of a retreat away from home and work where you can always find the best that Gaithersburg has to offer. The community is nestled closely to a 7-acre nature preserve and a short walk from Great Seneca Park. The project is located at the intersection of Watkins Mill Road and MD Route 355 where a new exit 12 accessible via Watkins Mill Road will offer a direct route to to I-270 and the Biotech corridor as well as Parklands, a brand-new town home development. 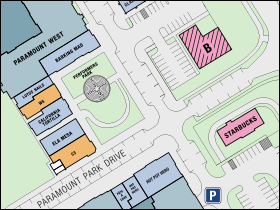 Spectrum’s residential components include Paramount East and West, a 224-unit apartment project alongside the Majestic, a 243 unit luxury apartment all leasing now! Residents can enjoy access to all three apartment buildings which each offer their own custom decor and amenities. Come join us as we continue to grow as a community and staple of the Gaithersburg area.